And they're off! Someone's on the run and someone's chasing them. Usually for a large sum of money. Whatever's at stake, we're just along for the ride, for the adrenaline rush that takes us from Point A to Point B. It's about the struggle of the 'good' guy (even if they give him a buddy to help) to change, grow, or overcome something or escape from/catch someone within a certain time frame. No matter what they are facing, YOU KNOW which side you're supposed to be on, theirs. It's not Action. I know. But it's so cool and so influential . . .
Deckard is the Hero; the human character chasing replicants to destroy them, and discovering the truth about himself along the way. He struggles with what makes us human and them replicants, and falls in love with a replicant. The question of whether he is human or a replicant chasing his own kind, add tremendous irony to the chase. To me, the signs in the movie seems to clearly indicate he is a replicant (although some still argue he's not). Through making Sean Young's character realize she is a replicant, I think he sees the signs that he himself may be a replicant, and because he's fallen in love with her, he decides to run (like the characters he was chasing). More interesting to me than whether or not he's human, is whether, as a human, he falls in love with a replicant and loves her despite the fact that he knows she's a replicant, or if he he falls in love after he realizes he's a replicant and that connection adds something to what he feels: The shared 'awakening'. In a way, we are all replicants because nobody knows their 'expiration date'. I like that instead of taking lives, he decides to live his. This is a nail biter to be sure, and is PACKED with Action, Gnarly Kills, and everything you want in a Action Movie like exploding helicopters, all-out fights, lost of cheesy one-liners, and a heaping helping of "R" rated violence and death. The director is Renny Harlin (you know, The Long Kiss Goodnight, Die Hard 2). This is an Action Movie classic and Stallone the Action Figure in peak form. If you've never seen it, please do NOT watch the trailer first. You'll be kicking yourself for not listening to me. It totally gives away the incredible opening. I don't think there's been an opening with this much tension since. Enjoy! Arguably the best-ever Chase movie. It's as much about Tommy Lee Jones' character as it is about Harrison Ford's. You're supposed to be on the side of the law, but you're on the 'wrong' side 'cause Harrison Ford is innocent and the Tommy Lee Jones is wrong, but he's just doing his job. There is really great tension in the hunter/hunted relationship and you wonder which of them will outsmart the other and 'win'? The movie might seem a little light on action but they crash a real train. 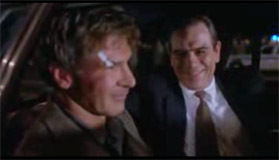 Right up until the end you sympathize with Harrison Ford because you know he's innocent, and you think that Tommy Lee who represents the law and should be a good guy is going to kill Harrison anyway for escaping, which would make him a letter-of-the-law, career-obsessed bad guy, and this keeps you guessing. These two characters could end up as buddies after this ordeal, but what would they do? That would be a cute older-guy Buddy Action Movie. They might be off fishing in a cabin somewhere and run into trouble that they have to step in and do something about. Feel like the bad asses again, be the heroes, work together. . . . Anybody listening? 'Cause the only script I'm working on is for action women (yeah, I'm a girl . . . ). Tommy Lee Jones won a Best Actor in a Supporting Role Oscar for this performance, and it was nominated for Best Picture! is a Chase movie carried to incredibly creative levels. (John Woo!) Not only is Nicolas Cage chasing John Travolta, but in order to find him, he has to become him. The lines of good and bad are smeared 'in your face'! It's heartbreaking to watch the bad guy use the good guy's appearance to do bad things, and confusing to watch the bad guy being good 'cause it's really the good guy inside. John Woo has such a sense of style. His action movies are beautiful to watch and visually dramatic. The way he frames certain things or emphasizes particular actions or details is sheer poetry: like the way Nicolas Cage's coat flaps in the wind. 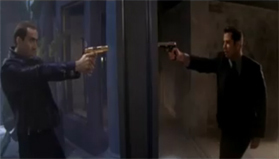 The scene where they end up pointing guns at each other through mirrors (shooting each other would be shooting themselves) is sheer GENIUS! Woo cornered the market on 'impossibly cool'. is a really cool Chase movie because it makes the bad guy the 'good' guy against worst guys. Aaaah how I love this movie. The whole movie is the HOT pursuit of Riddick, and then the tables are turned (sweet). By the time Riddick and the inmates break out of the Crematoria slam, it's so "ON" it feels like you're part of the red-hot, run-for-your-life momentum. They do a really good job of making the Necromongers scary, so the fact that they're due at any minute, plus the prospect of being fried, makes the whole cross-planet chase pretty intense. This movie delivers in the best way: It transports you to another world. The whole look and feel of it is breathtaking. I am obsessed with this movie: Check out my full review . . .
A BLOODY GREAT SLICE OF ACTION! Centurion is a great chase story. Loved how even the credits are on the move, which (combined with the music and the landscape) starts the movie off with a sense of urgency and adventure. You think after you hear the shields hit the ground, they're protected, they're ready, they're Romans, but you haven't met the Picts. The Picts roll enormous fireballs downhill from both sides that crash through the ranks. So much for organization and strategy. The sight of these hurtling balls of flame against shades of blue and green in the forest and the mist, alone, is worth seeing the movie for. With the defensive squares broken up, the Picts attack and the fighting begins. The repetitive sound of striking steel and the squishy sounds of stabbing increase in tempo driving the action and the anticipation to a final beheading.The Picts are vicious savages—its awesome! Awesome is a word that came too mind all too often, if that tells you how AWESOME the movie is. In the General vs. the she-wolf fight, the character Etain is handy with a spear, and uses it as deftly as a knife and a fork! LOL Her primal scream (!) after she kills is awesome. There's that word again. I liked how the other Pict warrior girl had yellow hair and yellow teeth. For such a small role, she struck a lot of fear!